Medical myths are part of our everyday life. Everyone knows them but only a few realise that they are myths and not real: Eating carrots will improve your eyesight. Spinach makes you stronger. Fresh is always better than frozen. Computer screens can damage your eyes. Cholesterol is bad for your health. These are examples of medical and health myths that survived over the years. Many people, including doctors believe in these myths although they are either not true or lack scientific evidence. Some of these myths also have very amazing and unbelievable origins. This is one of the best medical myths ever. We have been told many times that eating carrots improves our eyesight because they contain a lot of vitamin A. Indeed carrots do contain vitamin A but consuming a lot of vitamin A has nothing to do with improving our vision. The origins of this myth go back to the dates of World War II. The British Intelligence service spread the rumour that their pilots ate a lot of carrots and that’s why they were so successful in destroying German targets. The truth for their success was the use of radars and not the consumption of huge amounts of carrots!! In an effort to hide the existence of radars the British developed this myth that is sustained with great success until today. I am sure that most of us have seen Popeye getting stronger and more powerful with a tin of spinach. In fact Popeye is the first word that comes to mind when we hear about spinach. The truth about this lovely myth is that spinach does not make you stronger. On the contrary spinach is a vegetable that contains low levels of iron. There are other green vegetables that contain more iron than spinach. The myth that spinach is a full iron vegetable emerged from a typo mistake made in a report many years ago. In the report spinach was noted to have 34mg of iron (per half tin) but in reality is has only 3.4mg. This typo let people believe that spinach is a full iron vegetable and in addition to the low price of spinach it became very popular. Another reason that this medical myth lasts for so many years, and will continue to exist for a number of years, is of course Popeye! This myth is based on the fact that turkey contains tryptophan, an amino acid located in protein that affects sleep and mood. However, the quantity contained in turkey is not more than in other foods like chicken or veal and in some cases it is even less per gram than it is contained in pork or cheese. The myth apparently stems from the fact that all of us feel drowsy after a big meal (and eating turkey is a big meal), because the body consumes energy for digestion and thus the blood flow and oxygenation in the brain is reduced. An article by the USA National Academy of Sciences (60 years ago) noted that a good indication for water consumption for adults is 2.5 litres a day. In the same article they also noted, in the last sentence, that this quantity is already contained in the food we eat. In other words we consume the water our body needs in the food we eat. Researchers suggested that if we ignore the last statement from the article then it could be interpreted as a directive for the consumption of eight glasses of water a day. Other research suggests though that we get sufficient levels of water in our body from the typical daily consumption of juices, milk and even caffeine drinks. From all the studies carried out so far researchers did not find any scientific evidence to support this medical myth. Coffee is consumed on a daily basis by millions of people. It is the world’s morning favourite drink. It is a fact that the excessive consumption of coffee may be hitting the nerves and this can cause increased excitability. Normal consumption of coffee though can be good for our health. A study by Harvard University with more than 125,000 people drinking coffee showed that women were 30% less likely to suffer ‘type 2 diabetes’. Other studies have shown that coffee reduces the risk of developing Parkinson’s and cancer of the colon. In addition, coffee rejuvenates the spirit and despite the impact in the energy levels of our body, coffee has absolutely no effect on the heart. Two to three cups of coffee a day is beneficial to our health. However if we notice symptoms of anxiety and insomnia, then it is better to reduce coffee or switch to decaffeinate drinks. This myth was created as a result of statements from medical dictionaries and reports made hundreds of years ago. An example is a reference made in a medical dictionary, which stated that “fasting is the best medicine for fever”. Cold and fever are usually due to viruses making cycles that last 7 to 10 days, regardless of what we do to combat them. Research did not prove sufficient evidence that diet affects cold or fever. Since scientists pointed out the benefits of antioxidants, people started to believe that eating more fresh fruits and vegetables is a better choice than eating frozen. In fact we tend to believe that frozen is second-class food. Frozen food can be as beneficial as fresh food because fresh fruits and vegetables are cut when they are at the top of their nutritional value and transferred to factories where they are frozen. This process locks down their nutritional ingredients and so frozen food has all the nutrients. Fresh fruit and vegetables when placed on the shelves – they lose some of their nutritional ingredients because of heat, air and moisture. During the 60’s and 70’s, scientists have associated blood cholesterol with heart diseases. Eggs that are rich in cholesterol eventually came out of our daily diet. Recent studies showed that saturated and trans fat in the diet of a person are more likely to increase the risk of heart disease than eggs. One egg has only 1.6 grams of saturated fatty acids, while a glass of milk with 2% fat contains 3 grams of saturated fat. Eggs provide protein in the body as well as vitamins A and D without making you gain extra weight. If you eat an egg for breakfast, you simply need to be careful with the amount of cholesterol that will take from other foods during the day. Many people think that bananas are high in fat. The truth about this myth is that bananas are actually low in fat. Bananas are made up of 95 calories and ½ gram of fat. 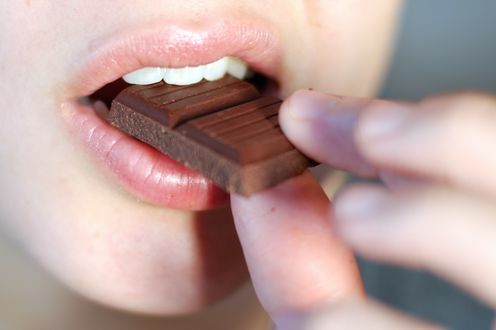 There is no evidence that chocolate; sugar, oil, milk or any other food causes acne. Some people believe that certain foods may be the cause of acne. No clinical research has proven that food is associated with acne. Myth 11: Natural products are safer than artificial. Mother Nature has produce some of the most dangerous substances known to mankind-among them arsenic and botulin. Humans have created laboratories to produce medicines that can control or treat many life-threatening diseases. Many important medicines also come from plants that are not only acting as medicines, but also have the side effects of medicines. The safety of a product, whether natural or synthetic, can be assessed only in carefully designed clinical (in humans) studies – and there are few natural substances that have been tested this way. Therefore it is not justified in any way that natural products are always safer than artificial. Exceptions to this myth are cases where it has been clinically proven. The abuse of drugs is a very well known problem. Some people tend to take medicines with the slightest pain while others avoid medicines and drugs completely. The pain relief drugs are more effective when taken at the start of a pain episode and not when the pain has fully developed. Actually it is recommended to use pain relief drugs in advance when you know that some activities will cause you pain. For example if you have problems with arthritis and you plan to make some manual work that usually gives you pain, you better take a pain relief medicine before starting the activity. Myth 13: Cholesterol is bad for you. There is ‘bad’ cholesterol and ‘good cholesterol’. Bad cholesterol is created by saturated fats found in food like meat and cheese. This type of cholesterol can be the cause of heart diseases. Good cholesterol is found in unsaturated fats such as nuts, seeds and oily fish. Good cholesterol helps transporting bad cholesterol away from the arteries, back to the liver. The theory for using only 10% of our brainpower is there for almost a century. Sometimes this belief is charged to Albert Einstein but this has not been recorded to any report or statement. It is believed that the reason for maintaining this myth for so many years is to teach people the importance of self-improvement. Nevertheless, figurative and metabolic brain research and other studies from investigations of people with learning disabilities showed that people use more than 10% of their brains. The different iconographic investigations proved that no part of the brain is absolutely quiet or inactive. A detailed study of the brain failed to indicate the non-active 90%. This claim is repeated in movies but it is not true. The hair and nails require a «complex hormonal coordination» to grow that stops after death. This myth is repeated by the media and reinforced when a short beard appears after shaving. A clinical study conducted in 1928 showed that shaving does not have an impact on the growing of hair, a finding that is also confirmed by more modern studies. When hair is re-grown after shaving they seem more rugged because they do not have the smooth head of the non-shaved hair. They also seem darker because they were not exposed to the sun like the non-shaved hair. This myth has been maintained over the time due to the complexities modern life has to offer. People tend to think that stress caused by our daily hassles can make our hair go grey. Cold does not affect our immune system unless we are so much cold and the defences of our body are destroyed – and this only happens in a state of hypothermia. We cannot get sick from cold, unless we catch a virus that will make us sick. The reason we get sick easier during the cold winter is not the low temperature but because we stay indoors and droplets of viruses give us the cold. When we keep our body warm this does not mean that we are protecting ourselves from getting sick. A study by Carnegie Mellon University in Pittsburgh showed that optimistic people exposed to the cold virus are 13% less likely to catch a cold compared to those who are more depressed! In 2007, an environmental group named Campaign for Safe Cosmetics checked 33 different lipsticks for lead. Despite the fact that there is no allowable limit of lead in lipsticks, 1 / 3 of the samples checked they contained a greater quantity of lead than that allowed in sweets. These findings created the myth that lipsticks can be harmful to your health because of the amount of lead they carry. The American Cancel Society after studying the results of this research decided that the risk from lead in lipsticks is extremely small. Lead poisoning is usually caused by other environmental factors, such as pipes and paint in old houses for example. In conclusion, there is no reason to believe that the use of lipsticks can poison you. This is a very common myth that has been around for many years. This myth is indeed correct if one has to participate in a swimming race, swim for a long distance or struggle with the waves or a strong current shortly after eating. The intense physical weariness with full stomach is never a good idea, because it can lead to muscle or stomach cramps. However, experts did not find a problem with taking a relaxing swim or going into the water shortly after a meal. What could prove extremely dangerous is swimming after alcohol consumption, because drinking may disrupt your judgement and encourage unnecessarily risky behaviour. Stress and the effects of hormones on sebaceous glands are the main causes of acne. It is not in any way proved that not washing our hands properly will create acne. On the contrary cleaning your face too often can actually increase acne as the body compensates to replace the body oil washed away. Myth 22: Don’t use batonettes to clean your ears. Batonetes might induce the cell ( «candle») deep inside the ear, and thus reducing hearing. If the accumulation of cell creates a problem for you, try medicated drops that soften them or make sure you visit a specialist doctor to clean it for you. The idea that low light ruins eyesight has its roots in the pain of the eye. Low lighting makes it difficult for the eye to focus, leading to fewer eye-closings and hence this leads to dry eyes. So reading with low lighting is «inconvenient» but does not create permanent damage to the eyes. The excessive use of computers both in the office but also at home has created the idea that computers are machines harmful to our eyes. Many people visit the eye doctors and others are making complaints about discomfort and fatigue in the eyes after prolonged and continuous use of the computer. A number of investigations and researches made for this myth have shown that computer monitors are not detrimental to our eyes. This is because it has been proven that the monitors emit very little or no harmful radiation such as X-rays or ultraviolet radiation. Therefore, with simple words, our eyes are not in a long-term risk from a computer screen. Various references suggest that mobile phones cause erroneous alarms to screen machines and the malfunctioning of medical electric pumps. After the publication of a medical report that included more than 100 cases of possible electromagnetic interference with medical equipment, the Wall Street Journal published an article on the subject, which led to the ban of mobile phones from several hospitals. So far research did not show any evidence that supports this myth. In 2005 the Mayo Clinic conducted 510 tests with 16 medical equipment and six mobile phones. The study showed a rate of only 1.2% that can be considered as a clinically significant interference. Another study made in 2007 with 300 tests conducted at 75 treatment rooms did not also prove any kind of interference. On the contrary a major investigation showed that the use of mobile telephones by doctors is associated with a 22% reduction in medical errors due to delays. A team of researchers from the American Society for Reproductive Medicine carried out a study with 364 men. The purpose of this study was to see if the use of mobile phones could affect male fertility. The study showed that men who used their mobile phones for more than 4 hours per day showed around 23% lower concentration of sperm compared with those not using any mobile phone. Although the researchers raised the theory that the decline in sperm quality can be either the effects of electromagnetic radiation or heat in the testes, this is just a theory based on a survey. Therefore it remains a simple observation and is not based on concrete facts that can prove that mobile phones can indeed affect male fertility. It excludes, for example, other important factors such as stress or a sedentary lifestyle. This myth suggests that the body metabolism i.e. daily energy consumption is the same for both men and women. The proportion of fat and muscles in the body is what determines the amount of energy required. Men, who typically have less fat and more muscles tend to spend more energy than women, therefore they have a better metabolism than women. This myth is completely wrong. Overweight or obese people have a better metabolism than normal weight people. This is because a fat person burns more calories for movement because it needs more energy (due to the extra weight) compared to a normal weight person. As we get older our basic metabolism is actually decreasing. This because over the years our body muscles are reduced and fat is increased. More specifically, the basic metabolism of the individual from the age of ten is falling about 1% to 2% per decade. Digestion is a function of our body that burns many calories. So greatly reducing the quantity of food we eat, our body will also reduce the rate of metabolism to save energy. If we want to increase our metabolism we must not reduce the meals we eat but to choose food with fat-free protein and a lot of fibre. Furthermore, consumption of small meals at regular intervals (every 3 to 4 hours) promotes the better distribution of energy in our body and as a result this increases the basic metabolism. Great article! I knew about the acne and food one, but it is just amazing that I try to tell people that and no one ever believes me! Myth 31: Our eyesight can only be improved with an eye surgery, or glasses/contacts, and vision-corrective eye exercises don’t work. – IMillions of people around the world, at different points in history, have proved this wrong, including myself. They DO work, and people restore their vision that way!! An explanation for Myth 15 is that the body shrinks as it dehydrates after death, that’s why some people think the nails grow.